Express your affection for a spouse or loved one by sharing a pair of Eagle and Raven (Lovebirds) dog tags. The pair of tags display the lovebirds within a heart shape in this sophisticated design by Odin Lonning. The 1½ x &frac78; inch tags also work great as a single Raven, shown here with a slightly curved beak, or Eagle Dog Tag. The reverse side is plain, suitable for engraving by your local jeweler. The dog tag is sterling silver with a 24 inch sterling silver ball chain. Made in USA. 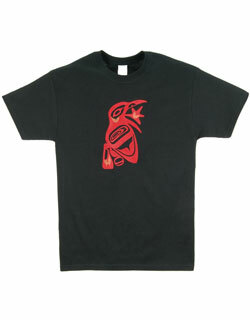 The most important of all creatures to the Northwest coast Indian peoples was the Raven. He took many forms to many peoples -- the Transformer, the cultural hero, the trickster, the Big Man. Full of magical powers, the Raven could transform himself into anything. He put the sun in the sky, the fish in the sea, the salmon into the rivers. His antics were often motivated by greed, and he loved to tease, to cheat, to woo, and to trick.